Tonight had me venture to Pour House in Hamburg after a Twitter follower pointed out to me they have a wing special on Mondays. Bored, hungry and perfectly willing to sit in a bar by myself and eat, I said why the hell not. I’ll say right off the bat the bar has that local feel and the bartender was awesome. Also, because it was wing night I got 10 wings, a diet coke (sorry boozers) left a 33% tip and still only spent $9! That’s ridiculous. Extra bonus points for literally being the first and only place I’ve been since being back on this Buffalo trip to give me ALL flats, and it’s not a secret I’ve visited several places recently. Also, here’s a secret of the pros —- when a place has a wing special, if you get there right at the start you’ll have no wait at all, as the cook is anticipating orders and throws down a ton of wings 10-15 minutes before the special starts. I ordered my wings and no hyperbole, I was wolfing em down less than six minutes later. I highlighted many things that were great. There’s actually just one thing that wasn’t great but unfortunately it’s the biggest factor of all. I simply don’t think the wings were particularly good. As everyone knows I like my wings atypically—extra saucy and not crispy at all (with as many flats as possible). Obviously the order was given properly as I got all flats, but they weren’t very saucy and definitely were on the crispy side. For me these were middle of the road bar wings. I’ve had far worse and wouldn’t actively avoid them were I at the Pour House again and hungry. Right across the street is Mamossers, a place who had wings I semi-raved about on Saturday. 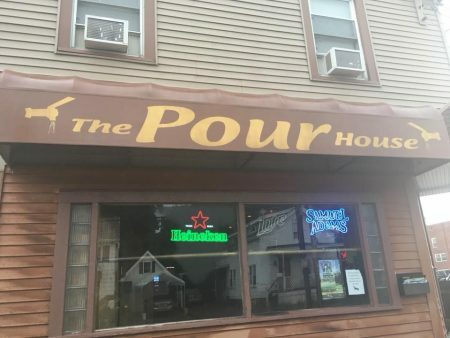 I think Pour House has the (far) better bar I have to be honest—their wings are serviceable but I can’t go higher than that. To use my NFL QB comparison, Pour House has the Josh McCown of chicken wings.